I have a diagnostic page where I hide classic report regions that aren't relevant - ie, have no data returned. 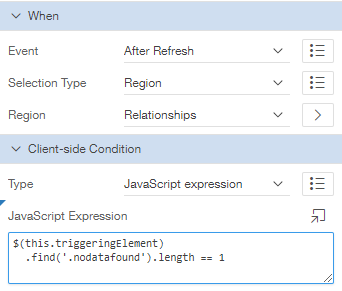 Here I create a dynamic action that executes After Refresh of the relevant region. The client-side condition evaluates the presence of the .nodatafound class within a classic report, which is present only when no records are returned. The triggering element is the region, so find the class within that region, count the result set, and compare to value 1. Instead of the region itself, this could relate to other components only relevant when records are returned. This can mean there is no need for a server-side condition to test for existence. With this dynamic action, the region could re-appear upon refresh with results, making the page more interactive without requiring full page submission. Might also want to consider the classes for the IR and the IG.